Lauren Walsh is a junior at Horizon Christian Academy. When looking for a school, she decided to tour Horizon Christian Academy since her mom taught at HCA and her brother, Ian, attends. Lauren made the choice to transfer because she said it felt like home. She is very happy with this decision and appreciates the things that makes Horizon unique, including small classes and wide array of extracurriculars to be involved in. 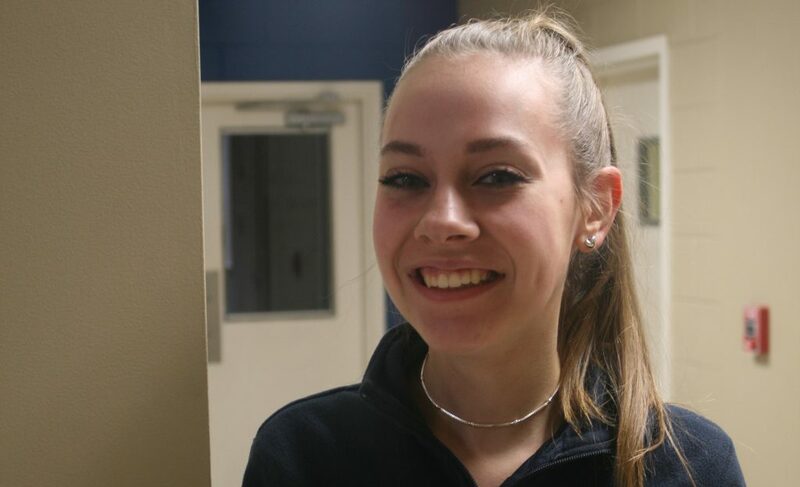 She says her favorite part of HCA is and the opportunity to be one-on-one with students and teachers, which she says wasn’t the case at West Forsyth, her prior school . She was involved in visual arts at West, but says she prefers Horizon’s program. 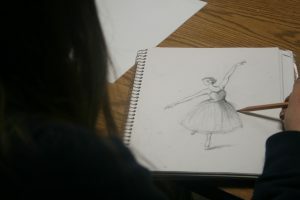 At West, she says, the class was built for large class sizes and students couldn’t pursue their own artistic ideas. At Horizon, Art teacher Mrs. Wilson considers Laurens goals and dreams and helps her make them a reality. It is individualized help like this and small class sizes helps foster an ideal learning environment. The Horizon visual arts program allows students to explore their own artistic style and learn best practices for using variety of mediums. Lauren has been interested in art since a very young age. In fact, she started painting before she could walk, she says. She knew she wanted to have a career in art since sixth grade, and this continues to be her dream. She describes her art as expressionistic, and says it comes from the inside-out. She appreciates spontaneity and likes being able to create whatever she wants in class. One aspect of visual arts that Lauren has a particular passionate for is fashion design. She likes making people feel pretty and she finds purpose in helping people build confidence in themselves. You can oftentimes find her sketching an assortment of clothing pieces. Lauren describes her style as minimalistic but classy, and draws from sales of the 50s and 60s. She is proud of her work and intends to submit her designs to art shows, in addition to the art competition at Horizon. Lauren plans to attend Savannah College of Art and Design after graduating. She expects to major in fashion merchandizing/design or marketing. Her dream is to either work for a professional designer or to be one herself. It is clear that Lauren is thriving at Horizon and enjoying her opportunities here. It is experiences like her’s that makes HCA an amazing environment.